Pittsboro's Full Service Drywall Contractor. Call today for fast, professional service by a local drywall company that does it all! Hanging, finishing, repair, restoration and popcorn texture removal work. Drywall by a skilled expert in Pittsboro. Local Full Service Drywall: nail pop, small holes, poorly finished joints, loose cracking joint tape and metal corner bead, holes, stress and settlement cracks, wet and water stained or damaged walls or ceilings can look like new. 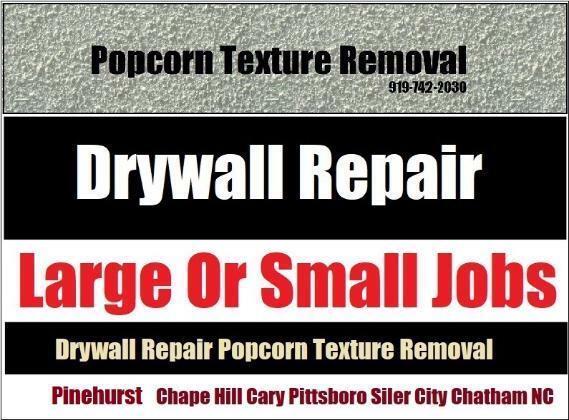 Drywall Specialist Copyright 2017 All Rights Reserved 919-742-2030 Professional Drywall Contractor - Installer, Finisher, Repair, Restoration And Popcorn Removal Work In Pittsboro NC.